Trinidad and Tobago are unique among Caribbean islands in that only 10,000 years ago they were a part of the South American mainland; the geology and rich flora and fauna are closely akin to Venezuela. A mountain range runs along the north coast, rising to Trinidad’s highest point, El Cirro del Aripo (940 metres); there are rolling hills in the south and the flat Caroni Plain lies in between. Trinidad is well supplied with rivers, some of which end in mangrove swamps on the coast. The Pitch Lake in the south-west is the world’s largest natural reservoir of asphalt. A string of small islands off the north-west peninsula are the remnants of the land-link with the continent. There are sandy beaches in the north and east, and Trinidad has many excellent harbours. 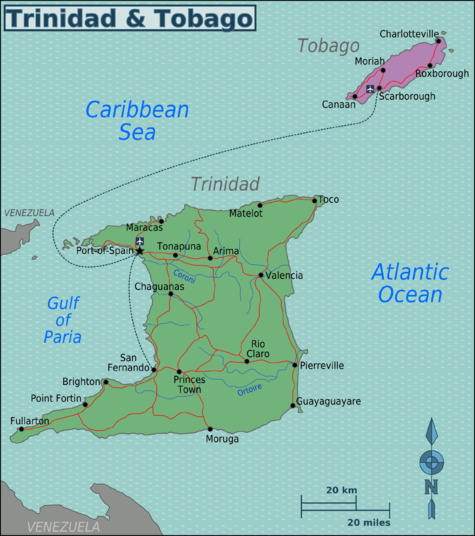 Tobago also has a central mountain range descending to a plain in the south-west and many fine beaches. Trinidad and Tobago comprises a unique mix of races and cultures that can be traced back to Africa, India, Europe, the Middle East and China. The influences of the native American Indians are also prominent features of local culture.